From June 25th through August 7th, Stanford played host to the Stanford Jazz Workshop, a musical meeting of the minds dedicated to jazz education and appreciation. 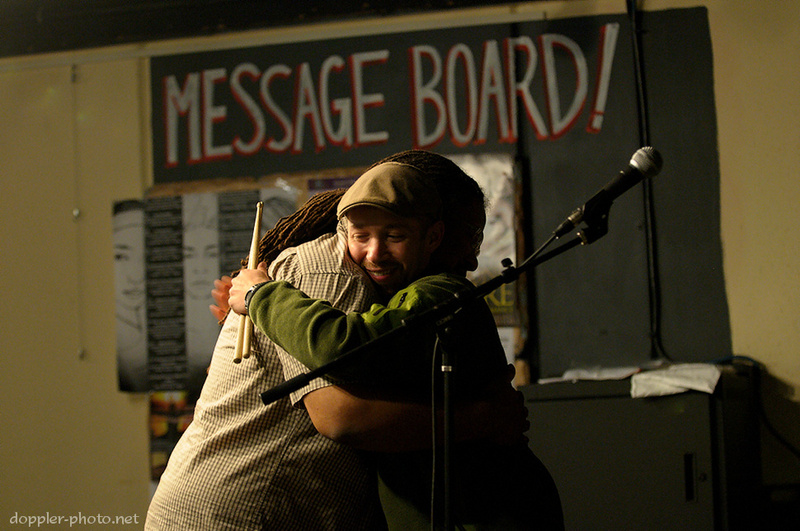 The Workshop consists of the Jazz Festival (a series of over 20 performances) as well as a number of teaching programs. That I ended up at Stanford for an evening of jazz was in itself one of a multitude of coincidences that night. I had been planning to go for a while, but didn't actually take action until a coworker sold me his ticket. And thank goodness, because it was a fantastic night. One of the main things that struck me was the atmosphere. It seemed like everyone was a friend, either a friend from long ago, or one simply waiting to be met. The greetings weren't handshakes, they were hugs. The evening started with a concert: trumpeter Nicholas Payton, performing with the Taylor Eigsti Trio. 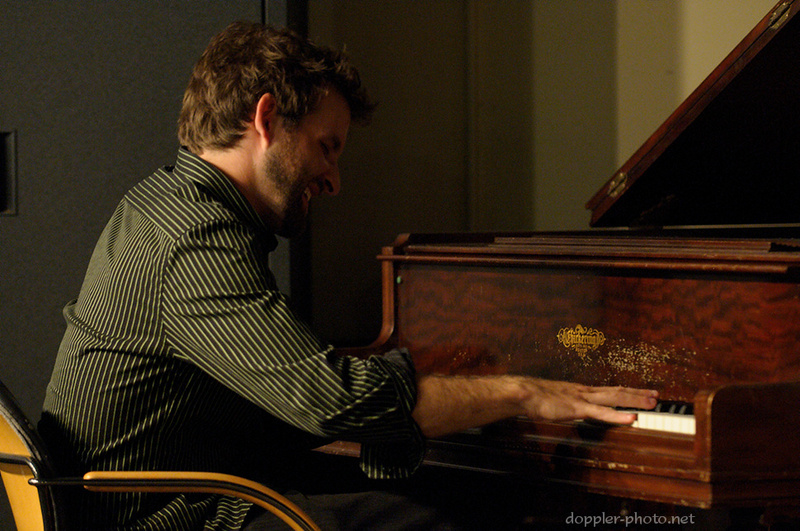 For a few minutes every song or two, Payton would leave the stage and the trio of Eigsti on piano, Reuben Rogers on bass, and Eric Harland on drums would play alone. 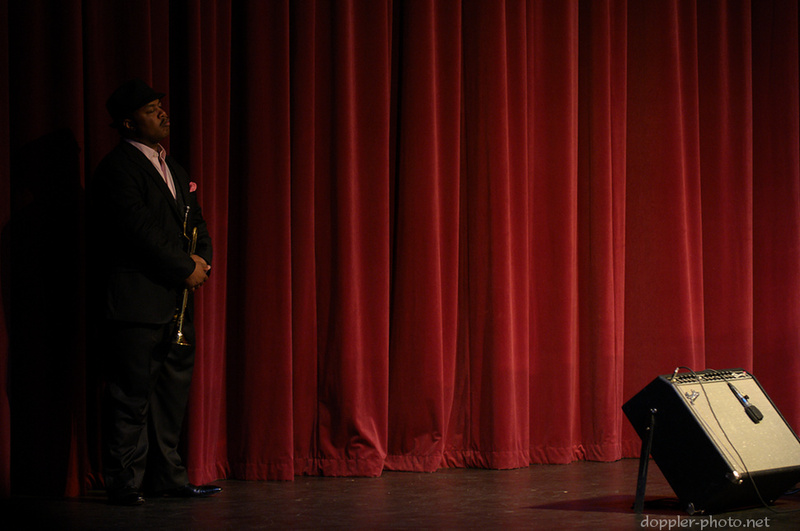 On returning to the stage, Payton would stand back in the shadows for a bit before he returned to center stage. Here, Payton waits with a pensive look during one of those breaks. One can only imagine what was going through his mind at the time. Through a further sequence of coincidences, and with much thanks to Jimmy, I ended up at the Stanford CoHo after the concert's conclusion. The CoHo Jam Sessions offered a venue for growing musicians to play with Jazz Workshop faculty as well as with other experienced musicians. Around midnight, Taylor Eigsti, Harish Raghavan (bass), and an unidentified drummer hopped on stage to play a short set. Oddly enough, Eigsti was one of the main reasons I ended up buying my coworker's ticket. Back in January, I was witness to a fantastic concert of Gershwin pieces that Eigsti played with Raghavan, Eric Harland (drummer during the Nicholas Payton performance), and the Peninsula Symphony. That Eigsti was included on the bill for that night made the decision to attend a no-brainer. On multiple occasions I was floored by how much energy the performers poured into their solos. 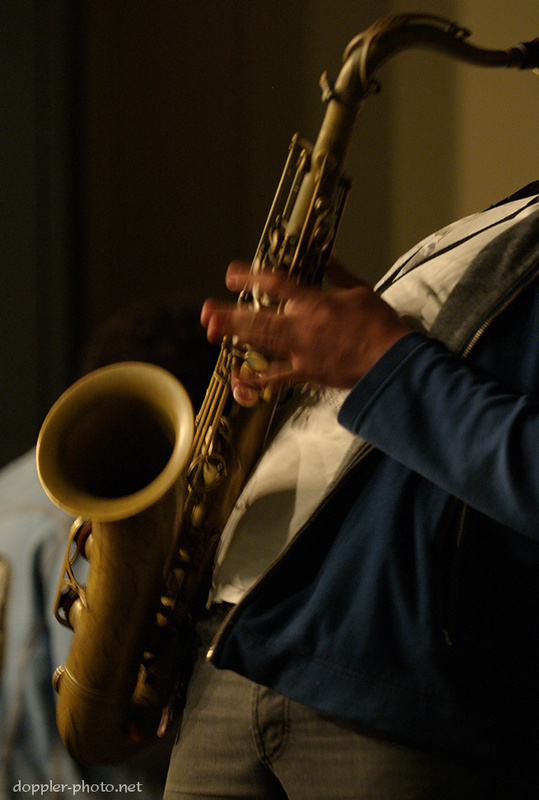 Above, a saxophonist blows with everything he's got. 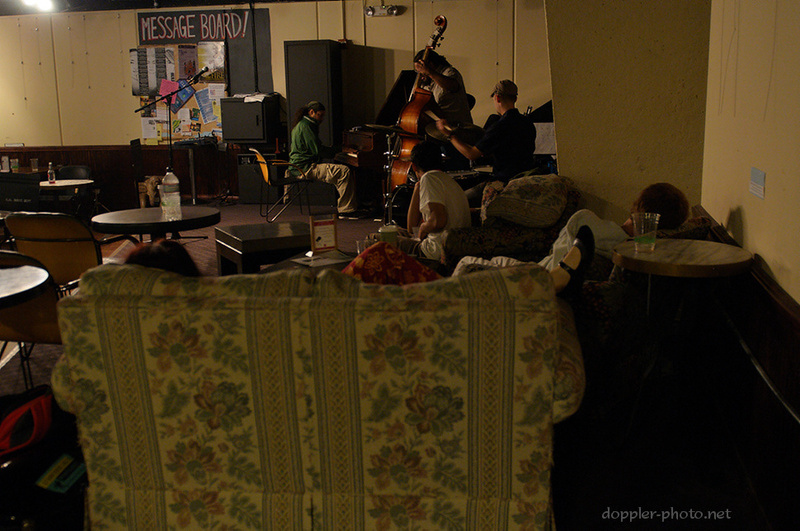 The CoHo stage area was a cozy, if somewhat quirky place. And among the last musicians to take the stage were this trio, with Zaccai Curtis on piano in the green jacket. As it happens, Zaccai's brother is Luques Curtis, a bassist who I happened to recognize. Luques had played a lot with MIT graduate and saxophonist Louis Fouché back when I was still at MIT. Hailing from New Orleans, Fouché was deeply affected by the aftermath of Hurricane Katrina, and became a major organizer of benefit efforts at MIT. I shot both Luques and Louis on a number of occasions, both before and after the hurricane; for instance, they performed during the "Pulse" culture show, which I shot for the 22 Feb 2005 issue of The Tech (see page 6). Howdy, Anonymous. If you want, you can just repost it here and I'll delete the other one. To respond, though, yeah, everything in the CoHo seemed like it had a bit of history, including all the instruments.